Other photos: Gulf Craft Salon, Gulf Craft Salon, Gulf Craft Salon, Gulf Craft Salon, Gulf Craft Dining, Gulf Craft Dining, Gulf Craft Dining, Gulf Craft Galley, Gulf Craft Galley, Gulf Craft Stairs to Staterooms, Gulf Craft Master Stateroom, Gulf Craft Master Stateroom, Gulf Craft Master Stateroom, Gulf Craft Stairs to Staterooms, Gulf Craft Guest Stateroom, Gulf Craft Guest Stateroom, Gulf Craft Aft, Gulf Craft Aft, Gulf Craft Aft, Gulf Craft Aft, Gulf Craft Profile, Gulf Craft Aft, Gulf Craft Lower Helm, Gulf Craft Master Head, Gulf Craft Guest Head, Gulf Craft Salon, Gulf Craft Transom, Gulf Craft Bow, Gulf Craft Upper Helm, Gulf Craft Upper Helm, Gulf Craft Flybridge, Gulf Craft Radar Arch, Gulf Craft Profile, Gulf Craft Sunpads, Gulf Craft Engine Room, Gulf Craft Generator, Gulf Craft Generator, Gulf Craft Fire Extinguisher, Gulf Craft Bow Thruster, Gulf Craft Electrical Panel, Gulf Craft Profile, Gulf Craft Profile, Gulf Craft Profile, Gulf Craft Profile, Gulf Craft Hull Out, Gulf Craft Profile, Gulf Craft Profile, Gulf Craft Profile, Gulf Craft Profile, Gulf Craft Hull Out, Gulf Craft Hull Out, Gulf Craft Hull Out, Gulf Craft Profile, Gulf Craft Hull Out, Gulf Craft Profile, Gulf Craft Profile, Gulf Craft Profile, Gulf Craft Profile, Gulf Craft Profile. This is a perfect example of a Euro style motor yacht. She is ready to cruise in style with all the comforts of home. She is a very well laid out yacht with lots of storage and beautiful woodwork throughout. Her twin 660hp cats can get up to 25 knots when she needs to or cruise down the waterway at 10 knots sipping fuel as she goes. There is a full complement of electronics and navigation equipment as well as a dingy. All the soft goods and coverings throughout the vessel are in very good condition with new carpet on the way. She has 3 staterooms and 2 heads. The fly bridge is large and spacious. 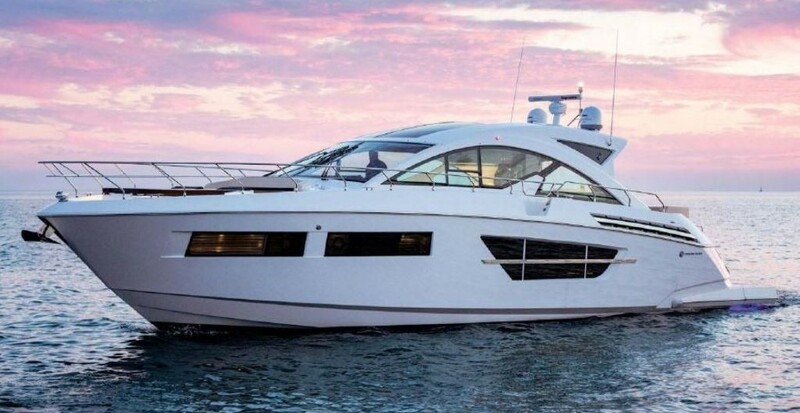 Her open saloon and aft deck offer excellent social areas ideal for entertaining guests! Entertainment equipment consists of a satellite system receiver, 2 flat screen LCD TVs, and a New Sony Play Station. Batteries are all new (2011) and the engine room is spotless. High torque props and new anodes were added summer (2011). There is 4 zone A/C with individual electronic controls, blowing cold (recently whole system was flushed and cleaned with new water intake pump installed). Brand new in 2011 - 4 Cylinder Kubota Generator 16 KW 110 V. If you looking for a great deal on a great yacht, check this one out.